This is an early advert for the ‘John Lewis’ department store. 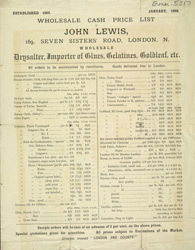 Mr John Lewis opened a small Drapers shop in Oxford Street in 1864. It became known for the quality of the goods sold there and quickly grew in size developing into a department store selling clothing, furniture, and household goods.